I currently find myself in between two landmark moments. A few weeks ago I was completely immersed in producing live television content, and in a few weeks time I will become an official BSc (Hons) Television & Broadcasting graduate from the University of Portsmouth. When I look back at who I was in my first year of university, I remember a shy girl from the other side of Europe, unsure at whether a career in television was the right path to take. Now, after three years of university, I can definitely say that I made the best choice of my life by choosing this degree. I’m leaving university confident and motivated, knowing that I made the right choice in study, and I really want that career in the television industry. 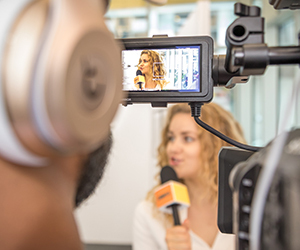 On the last day of term we Television & Broadcasting students had the chance to produce a three hour long graduate show, in which we had to showcase the work produced by many of the students from our Creative and Cultural Industries Faculty (CCI). It was the best live broadcast experience I’ve ever had, and I found myself in the roles of both producer and a floor manager. It was a stressful day, I was running from one studio to another, communicating with the crew and interviewees. At some point during the day, I stopped for a minute and I realised how much I enjoy it. It was an epiphany that I don’t remember having before. Perhaps it was because it was the last official show of my degree that I became aware of the pleasure I feel when I’m creating content, being in the studio, and making sure that the show runs smoothly. Whatever it was, I now know that this is exactly what I want to do in my life, this is what make me happy - the excitement I feel when the show is on air and the feeling of relief and pride when the PA counts zero and the show is over. Today, just a few weeks later, after sending hundreds of CV’s and not getting many responses, I find it helpful to remember that last live broadcast day, and the pleasure and confidence it gave. It helps me to move forward and send the next 10 emails. I know breaking into the TV industry can be quite tough and challenging, and it will require a lot of commitment and hard work. A lesson that the course has taught me is to be open-minded about the variety of jobs available in TV, and to believe in our versatility and ability to do any of the roles - from being a runner to an editor. Creating a perfect CV, one that clearly shows off all of the skills and experiences that I've acquired can be quite difficult. Talent managers get hundreds of emails every day and I'm lucky if they spend more than seven seconds on my CV. In the last month, I have updated my CV more than 10 times. After meeting with a BBC talent executive, my CV has changed completely, from two pages it has been condensed to a single page showcasing my key skills that can help me to stand out from the crowd. I have to face the reality, nowadays even with a degree impressing an employer can be quite difficult. However, the skills I've gained over these last three years can really help me to make an impression. My course was very vocational (70% practical) and the knowledge of how to use video cameras, sound recording equipment, Avid editing, as well as the creative ability to produce and deliver live TV programmes, are all of the elements that I’ll need to showcase. I have always wondered how an employer might see past a CV and get an indication that I'm reliable, organised and charismatic. There may always be somebody else with slightly more experience, and a slightly better CV, but if those thoughts enter my head, I think back to the belief instilled in me via the academic course team (Charlie Watts, Zoe Sale & Gary Bown). They believe in me, and this make me believe in myself. So, I'm ready to start the next chapter of my life and work hard to achieve my goals. I know that I'll have to potentially start at the bottom - This could mean runner roles, but I deeply believe that the simplest yet the most industrious work can give me valuable experience, and anyway, making coffee and tea can be fun! From now on I may have to face more rejection, but as American businessman Mark Cuban once said: “Every no gets me closer to a yes”. So hopefully I'll hear that yes sooner, rather than later.